As babies grow, the speed at which their motor skills and cognitive abilities advance often serves to amaze their proud parents. They grow from a tiny infant who can only instinctively grab on to an adult finger to a baby that can manipulate toys with determination. Though babies will develop the ability to grasp and play with toys without any help from their adoring parents, there are ways to nurture motor skills and cognitive abilities that are developing in the brain through basic activities using hand-held toys. The important thing to understand is the grasping benchmarks that babies must first achieve in order to have appropriate expectations. The watchful parent will note that as the months pass by, their baby shows increasing dexterity in the ability to grasp and play with toys. The standards below detail what can be expected of babies throughout the first year. 3 Months: No longer newborns, they can grasp objects placed in their hands, though they generally aren't able to reach out and grab objects. At this age, simply offer babies one toy at a time and allow them to develop their grip. 5 Months: Babies now can reach out and grab items willfully and independently. When offered a toy, babies will look back and forth between the toy and their hands. This is evidence of their developing ability to plan and coordinate their movements. When presenting toys to these babies, offer the toy so that they must reach out and grab it. 7 months: Growing 7-month-old babies grasp using their entire hand to cup the object and may use their thumbs to press the object securely into their palm. Visual acuity and perception also come into play and babies are better able to manipulate objects in their hands. Expose 7-month-old babies to a variety of age-appropriate toys and "chat" with them while they play. 9 Months: They have now mastered the ability to pass objects back and forth between hands. Babies show increased muscular agility and can begin to process how behaviors are connected. Offer hand toys that encourage problem-solving, like shape sorting blocks and nesting cups. 11 months: Babies at this age are practically pros at manipulating objects. Their grasping ability may now include the ability to roll and throw small toys. Play simple games that utilize grasp and teach the concept of taking turns. As early as seven or eight months, parents can monitor babies' ability to grip and to plan their movements with a simple activity using three hand-held toys. Not only does this exercise have babies hone their motor skills, it ties in higher-order problem-solving skills. 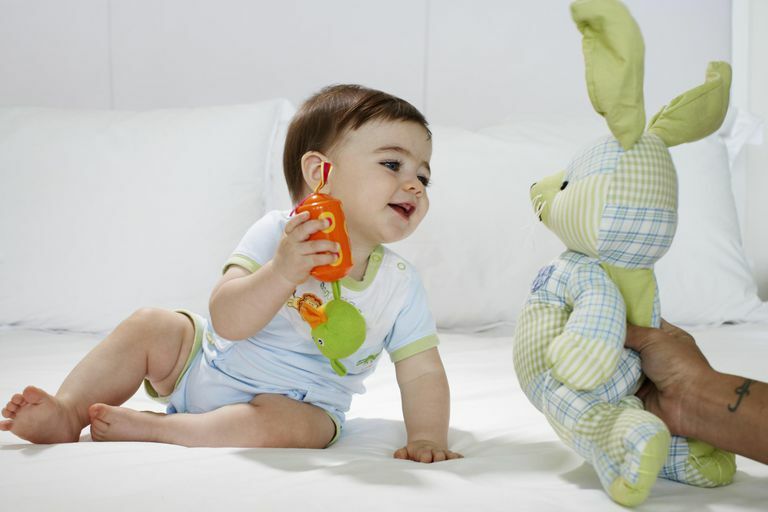 Gather three toys which your baby can grasp easily. Allow her to take one toy in each hand. With a toy in each of her hands, give her the third toy. Initially, she will likely be baffled and try to take the third toy without letting go of either one in her hand. As her cognitive abilities progress, she will begin to put a toy down before attempting to grab a new one. Why Would Parent's Try to Boost Brain Development? Engaging babies in developmentally appropriate activities are stimulating to their overall development. Parents can use these activities as a simple tool to note their baby's progress. It gives parents who may feel awkward around infants a structure for interaction and basic play. It's an easy, cheap, and effective way of promoting physical and cognitive development. You can also check out these other baby games and activity ideas. And remember, playing is work for babies, so don't be afraid to stop overthinking it and just get down on the floor and play with your little one. Having fun is the best way to help your baby. What Are the Benefits of Teaching Your Baby Another Language?